From the south side, it’s not easy to see which summit of Carihuairazo is the highest. Once an active volcano, there must have been a time in the distant past when this mountain was huge. It has long become extinct and has eroded so much that all that remains is a jagged outline of summits like a set of rotten teeth – not at all volcano-like. 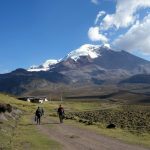 Rising over 5,000m, it’s a substantial peak, but it is often overlooked because of its close proximity to the giant snow-capped volcano of Chimborazo (6,310m), the highest mountain in Ecuador, which dwarfs it. Edita and I decided to climb Carihuairazo as part of our sea-to-summit challenge in 2017. 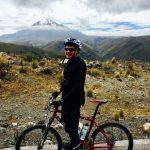 We cycled from sea level to the flanks of Chimborazo, then completed a full circuit of the larger mountain before climbing to its summit. We trekked the northern half of the circuit and climbed Carihuairazo on the way. It was an attractive peak as we approached it from the south. Its trio of jagged summits appeared to be glacier-laden, but our guide Rodrigo assured us most of this was snow. The summit on the left was whiter and was known as Maxim (5,020m). It was the highest of the three, although it looked lower from our position because it lay at the end of a summit ridge that we were looking along. The summit on the right was Mocha (4,960m), a black pyramid carrying only a few patches of snow. It rose up on the near end of the ridge. The middle peak was known less imaginatively as the Central summit. It was a little lower than Mocha and separated from it by a broad, snowy couloir. 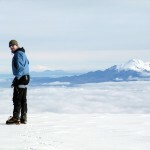 All of the summits looked accessible, and the mountain stood proudly over the páramo landscape. Nobody knows if the Victorian alpinist Edward Whymper made the first ascent of Carihuairazo in 1880, when he explored Ecuador with the Italian guides Jean-Antoine and Louis Carrel and made first ascents of many peaks. Nor was Whymper very sure himself. He made an ascent of a summit, but whether it was the main one or not is open to debate. He camped south of what he described as its two principal summits in June, believing the eastern one to be higher. It was cloudy when he set off for the top, and remained so for the entire ascent. He left his camp by lantern-light, accompanied by the Carrels, his interpreter Francisco Campaña, the ‘pleasant-tempered’ David Beltran from Machachi, and a dog called Pedro that had attached itself to the party. They followed a ridge which they had noted when the sky was clear. When daylight came the cloud was so thick they could rarely see more than 50m, and the last man on the rope was unable to see the first. After less than two hours they reached a glacier and cut steps up it. The snow steepened until Pedro started whining and refused to go any further. They took it in turns to carry him the rest of the way; his achievement in being the first canine to climb Carihuairazo was therefore tempered by the fact that this was clearly cheating. They reached the summit at 11am, ‘a snow cone too small to stand upon’. Whymper believed at the time that it wasn’t the highest point, and this was confirmed on the way down when the clouds cleared. They looked back and could see they had climbed ‘the western of the two principal peaks, which is distinctly, though slightly lower than the eastern one’. These days, we know Carihuairazo’s west peak, Maxim, to be the higher of the two peaks. So had Whymper and his companions climbed the main summit after all? 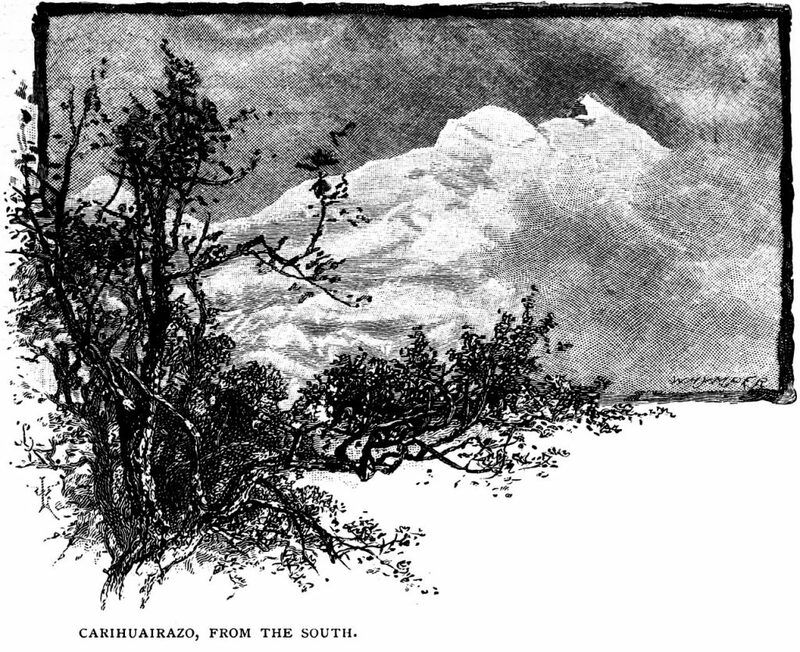 Earlier in his account he described Carihuairazo as having two principal peaks and a minor one to the west. He states that the eastern one is the highest. This could be taken to mean Maxim and Mocha as the two principal peaks, and a smaller peak called Loma Piedra Negra as the minor peak to the west (a peak we would soon be acquainting ourselves with in unusual circumstances, but you will need to read my book to find out why). There is, however, another clue in the form of one of Whymper’s engravings entitled Carihuairazo, from the south. Like Whymper’s route description, the engraving is itself confusing. It depicts two main summits on the right. The right (eastern) one is pointed, while the left is more of a snow dome. But on the far left of the engraving is a third, much smaller summit, hidden behind the branch of a tree. Whymper states quite explicitly the peak they climbed was the middle one in this engraving (i.e. the snow dome). The problem is that there isn’t really a view from the south that resembles Whymper’s engraving, unless the minor peak behind the tree is in fact the main summit Maxim. This seems the most plausible explanation, though quite how Whymper failed to notice that the supposedly minor summit to the west was in fact the highest of the lot is puzzling. He had been so meticulous in recording every last detail, including departure times, temperatures, barometric pressures, and the paw size of the dog which followed them up (OK, he didn’t actually record that). It would also make it a bit of a crap drawing, because in real life from the south the Maxim summit looks nearly as big as the Mocha, despite being a little further away. Unless he really was sketching from behind a tree, and didn’t think to crane his neck around the branch to check that the peak he’d sketched was the right size. All of which brings us to the conclusion that it’s likely Whymper didn’t climb the Maxim summit, but the Central summit. This would tally with his description of it being distinctly, but slightly lower than its neighbour (i.e. the Mocha). The first undisputed ascent of the Maxim summit was made in 1951 by Arturo Eichler, Horacio Lopez Uribe and Jean Morawiecki. If anyone is aware of a written source for this particular ascent then I would be very interesting in reading it. 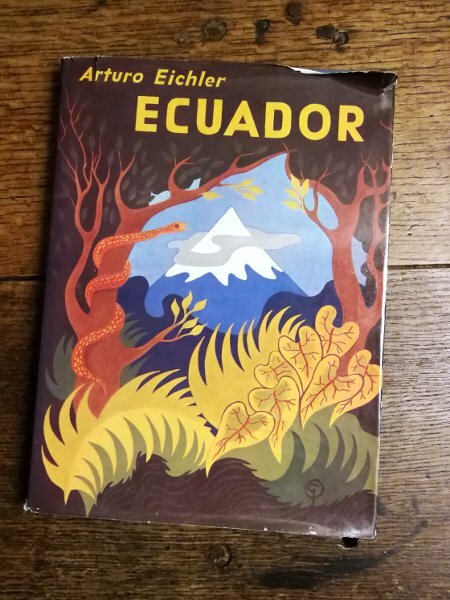 I bought the above colourful book second-hand from AbeBooks in the hope it would contain an account, but although it describes an ascent of Chimborazo and many other interesting stories from Ecuador, there is nothing about his ascent of Carihuairazo. Eichler, Arturo. 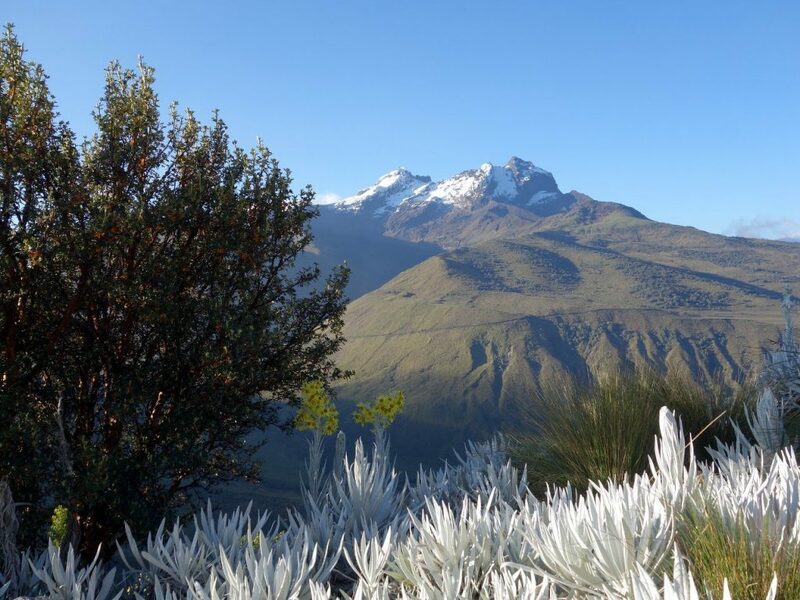 Ecuador: Nieve y Selva, Snow Peaks and Jungles. Quito: Edicion del Autor, 1970. Whymper, Edward. Scrambles Amongst the Great Andes of the Equator. London: John Murray, 1892. 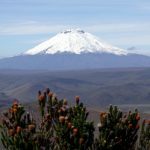 This blog post is one of the passages that has been cut from my forthcoming book about our Chimborazo sea-to-summit challenge, for the simple reason that it doesn’t contain enough jokes. 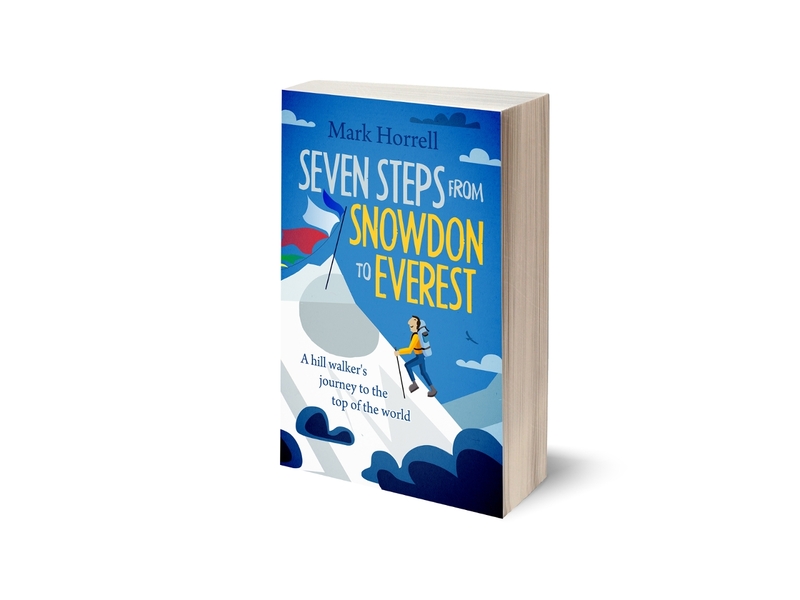 The book is a rollicking caper with the title Feet and Wheels to Chimborazo, and it will be published later this year. Please do consider buying it. More information coming soon. Well, disputed or not (because someone’s always wanting to be detractor), an achievement is an achievement. Don’t you know.